So I was wondering what air cooler should keep i7 9th gen processor cool. I am not planning to add a serious overclock to it for now ( but probably in the future) I would't buy water cooler because I am not fan of those. Personally i was looking for dark rock pro 4 or dark rock 4 because they are cheap in my country and I heard that they were good. But now I need your suggestions for air cooler. Thanks. The Dark Rock Pro 3/4, Thermalright Le Grand Macho RT, and Noctua NHD15S are all high end air coolers. I have the Dark Rock 4 (non-pro). I like it, it looks great works well enough. If you're not going with RGB ram, go with the Pro version IMO. Okay. Can you tell me temps with idle and load? I am maybe planning to buy rgb ram but i am not sure. Trident Z RGB RAM will fit under the DRP4 (not all RGB ram will, but Trident Z will - Linus actually puts Trident Z Royal under a DRP4 in his 1% build). Idle temps don't really tell you much. At stock settings, or OC'd to 5.1Ghz my idle temps are between about 30-35C (idle meaning web browsing PCPP, reddit, or Twitter), but the temps vary greatly depending on what VCore is set to, and LLC. "Under load" is even more a moving target. What does load mean to you? Does it mean Prime95? Does it mean RealBench? Does it mean Overwatch or Apex Legends? BF5? Not trying to be a **** here, but each of those puts the CPU under load and does very different things to my 9700K. Prime95 actually scares me. It gets so hot so fast, I pretty much don't use it. I may not have installed my DR4 100% perfectly, but either way, P95 is scary. 3 hrs of Realbench saw temps peak at I think 82C for a second or two. Typical gaming loads at 5.0 or 5.1Ghz are usually high 60s - mid 70s (lets say 67-72C). 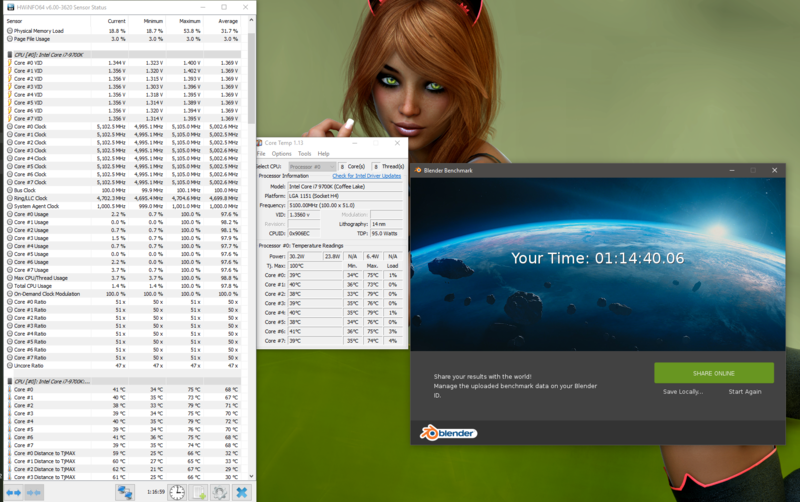 30 mins of AIDA64 at 5.1Ghz had me barely reach 70C peaks, with the AVG being around 60C. Full Blender run saw it peak near 80C with an AVG temp closer to 70C. I hope these numbers help, though there are so many factors that go into it it's really difficult to say what temps you should see. Yeah sorry i wasn´t very specific with my questions. I thought about getting a low profile ram such as trident z so i think there is no problem anyways. Idle temperatures as you said doesn´t tell much but for me it kinda shows if the cooler can even handle browsing etc. with low temperatures (and being quet at the same time). For me load means when the cpu is under a lot of stress for example in the realbench or in cinebench. But anyway thank you for the temperatures and the information. I wont´t add a heavy overclock (propably like under 4.5Ghz) so the dark rock 4 does the job i quess? the 9700k boosts to 4.8ghz on it's own, so its plenty quiet and cool for stock settings, yeah. be quiet dark rock 4 and pro 4 are good (rock 3 and pro 3 too), but bit bad value. The coolers mark linked perform the same or outperform the rock 4 and for the price of the pro 4 you can get better performing like Thermalright Le Grand Macho RT. tho if you really want a stealthy black cooler i guess you can go for them. I'll add the Cryorig R1 to the excellent suggestions made by the other guys.